← An Evening with W.O.L.F. 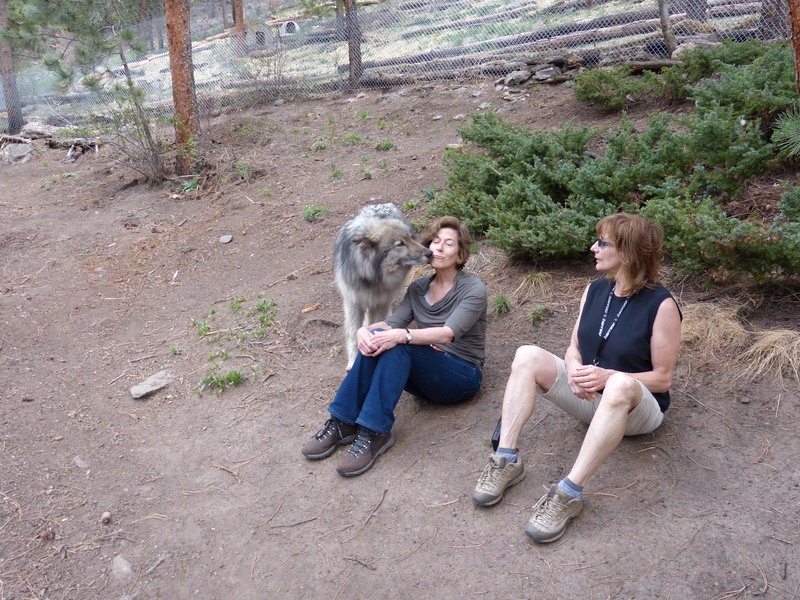 Last week I visited W.O.L.F., the sanctuary in the Colorado mountains. (The fundraiser I described in my last post was held near but not at the sanctuary.) W.O.L.F. is located on a private road, and the landowner restricts traffic to six cars a day. One result is that W.O.L.F. cannot be open to the public in its present location. Volunteers must carpool, and visitors are limited. The wolves serenaded us as we arrived. The enclosures are spacious, extending up the entire hillside, where the animals can run, dig dens, rest, or hide in complete privacy. 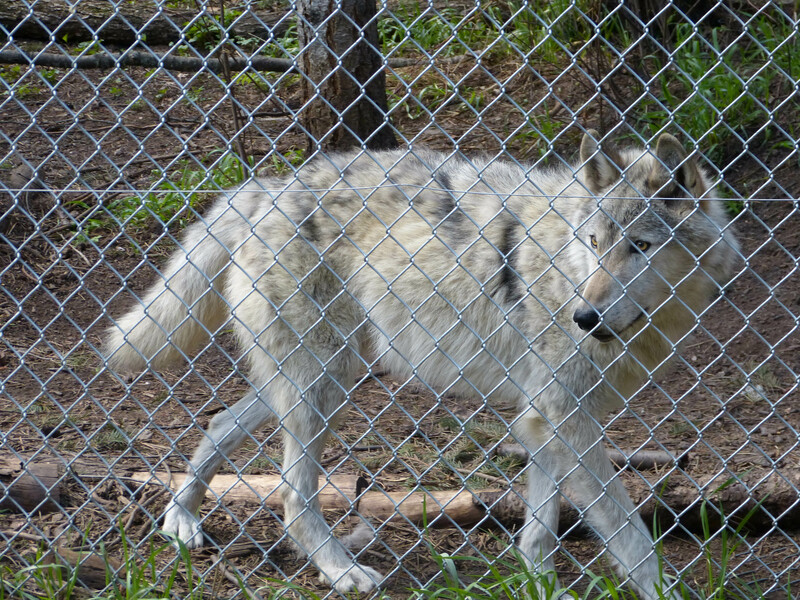 Some wolves were willing to approach their enclosure fence; others watched with curious eyes from a safe distance. Some would not let themselves be seen. 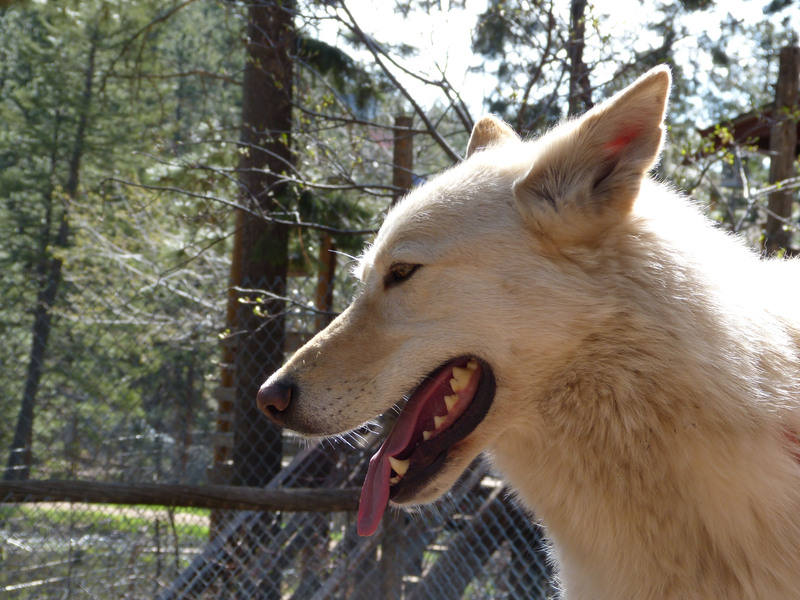 Each wolf is paired with one or two others in an enclosure. Staff members go to great lengths to make an appropriate match. We were permitted to enter two enclosures. 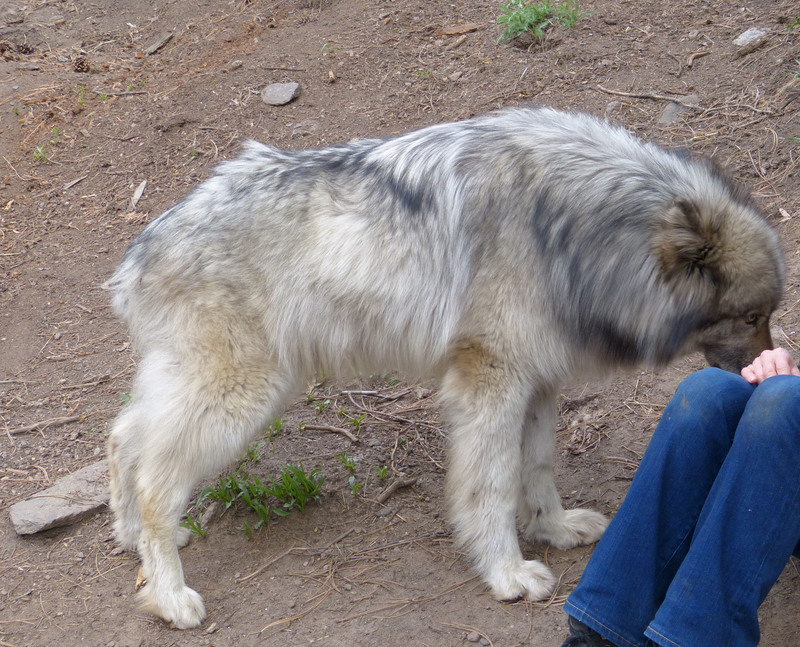 In the first, companions Pax and Sasha are well-socialized to humans. These two serve as ambassadors to local schools. Even so, we were told to sit separately. Wolves, like children, can be jealous of human attention. If they start to snap at each other, you don’t want to be in the middle. We sat down, and the wolves came to us. Pax stood on my legs, sniffing and licking my head and face. 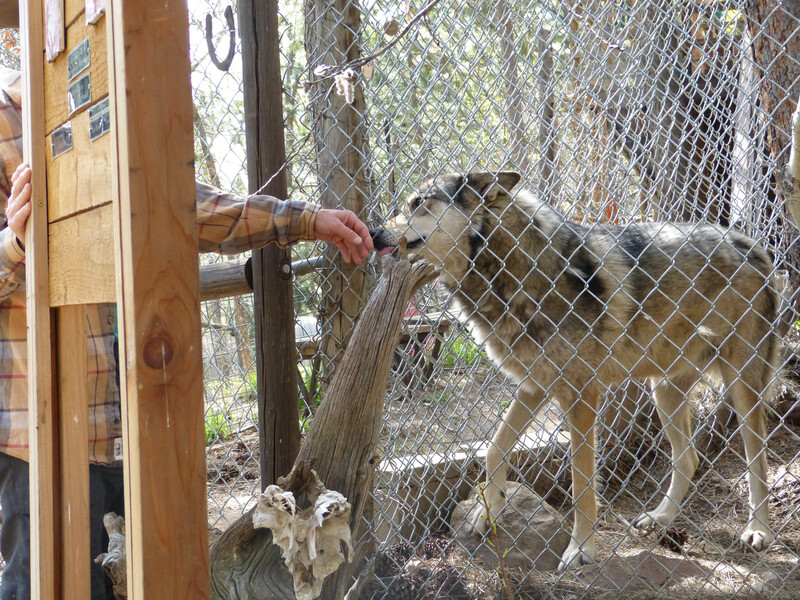 Wolves are very attuned to the head and demonstrate a strong physical connection to it. Wearing a hat can frighten or disturb them. The wolves stayed in constant motion, jumping down off the rocks, loping away and then back again for sniffing, touching, contact. I very much wanted to pick up a paw and look at the webbed feet wolves have, but I didn’t. I also wanted to stick my hand in their mouths to look at their teeth — but I didn’t. Better to respect them as wild animals making a home close to humans. Sasha and Pax were scheduled to visit a school near me today, and I was to accompany them. Visiting Denver is unusual, since the sanctuary is two hours away. 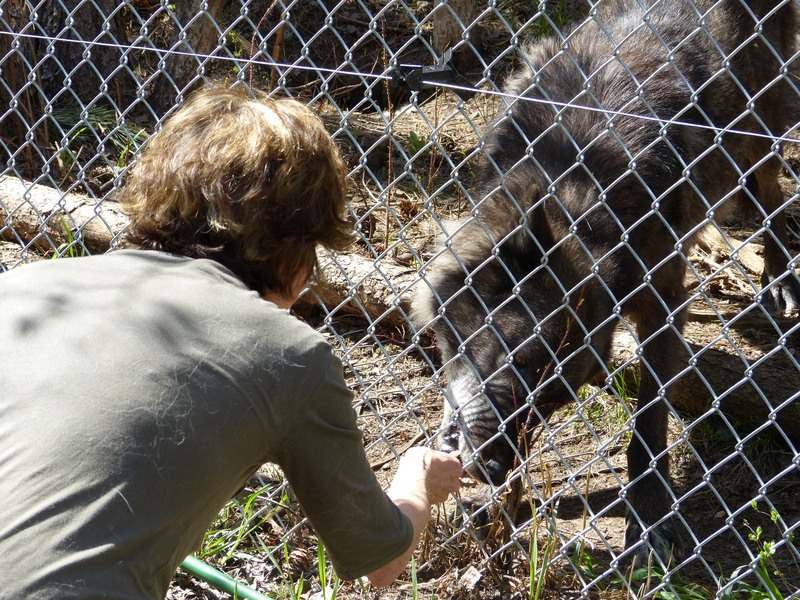 Whenever a wolf leaves the sanctuary for a school or other visit, he is tethered to a human. If the wolf tries to run away, he has to take the human along. I was going to be a tether. Sadly, last night the school cancelled the visit. Pax and Sasha have been to this school before, with safe and enjoyable encounters. But not today. Then there is Rajan. Rajan is also an ambassador. He often prefers to remain outside a building, and the children come to him. Told he was more skittish, he sidled up, sniffed, and stayed within touching range most of the visit. I did stick my finger in his mouth to look closely at his beautiful and enormous white teeth. Feeding Drake with a spoon – get a good grip on it! 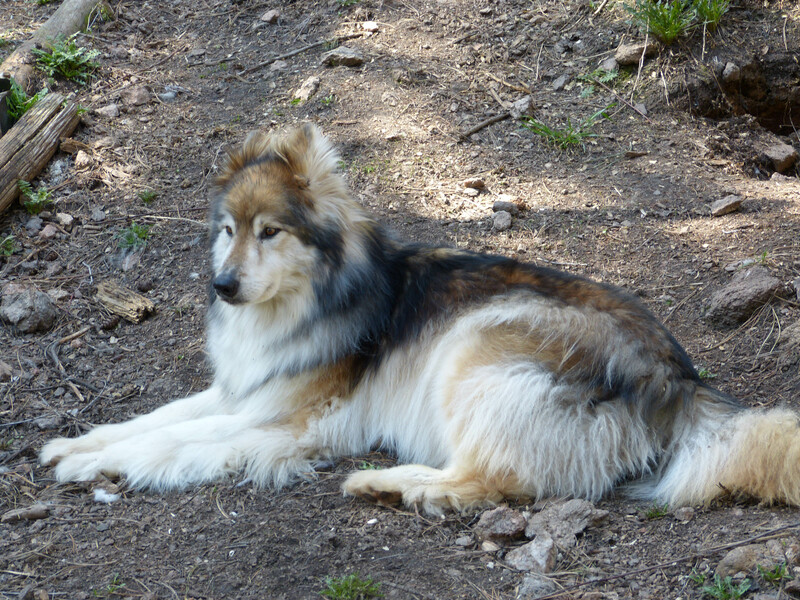 Sigmund, a wolf-collie mix – what a hair-do! Loki, who spent much of his pre-W.O.L.F. life on a short chain There is lots more to share about the sanctuary and its staff. But Yellowstone calls, and I must away. I look forward to catching up with you beautiful bloggers when I return. 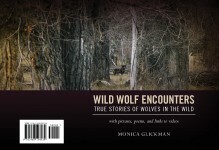 This entry was posted in wolves and tagged nature, W.O.L.F. Sanctuary, wolves. Bookmark the permalink. 18 Responses to A Visit to W.O.L.F. 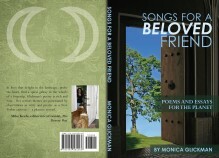 Very touching, Monica. I visited a wolf sanctuary in Massachusetts and could not contain my tears to be in the presence of such magnificent creatures. Bluebee, oh Bluebee!! I am so happy you are back!! Thank you – missed you! Thank you, dear Gislinde; I’m happy to see you back from vacation – hope it was a good one! So happy to have you here, Andro. I have to agree – that Loki is wickedly wild. Not very socialized to humans, which is fine except when care-taking must be done. You would be very impressed, iggynapster, with the quality of care, so respectful of their wild natures yet so in love with each individual. Thanks so much, Ian. I’d be interested to know if, in person, you would feel the same way. In the wild, so curious yet unwilling to approach; so complete in their wildness. In the sanctuary, dependent for survival yet not surrendering that quality of separateness. Touch and contact so important, whether with their enclosure companions or with humans. Fantastic blog, thoroughly enjoyed the story and the pics are great, a beautiful animal, must admit I would rather keep my distance to admire them. Hello Pen, It was so special to be there – very calming somehow. Staff and volunteers are simply devoted to these animals. Thanks so much for your comment, and I do love your new/old gravatar. That’s the original Pen. Aren’t they?! Thank you, Ela. I absorbed every word, Monica, and stared long at each of the photo’s .. each Wolf, an individual, especially Sasha and Pax, look so, so beautiful and intelligent. .. Many thanks for sharing your visit, ’twas a pleasurable and heartwarming experience. xPenx …, ….